Dr Nicole Zarafonetis is a researcher and policy analyst who specializes in gender and women's rights issues. Currently an independent consultant, her research interests include women in East Asia, gender and sexuality, and international women's issues. Dr Nicole Zarafonetis is a researcher and policy analyst who specializes in gender and women's rights issues. She has worked at several international and national women's rights organizations, where she advocated for greater gender sensitivity in the investments made by international financial institutions as well as for women's reproductive health and pay equity. She holds an MA (Hons) from the University of St Andrews in Modern History and Italian and an MSc in Gender, Development and Globalization from the London School of Economics. 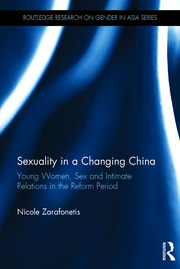 She received her PhD in Gender and Women's Studies from the University of York in 2014, where her research focused on the challenges and opportunities currently facing young women in contemporary China. Presently, she is an independent consultant and researcher. International women's rights issues, particularly in East Asia.